The eye is a wonderful organ that gives us the ability to see the world around us. Many people think the eye is just one sphere, orglobe. It really is composed of two spheres with different radii, one set into the other. The front sphere, called the anterior, is smaller and more curved of the two. This is called the cornea. The second sphere is called the sclera. The cornea sets into the sclera much like the glass on a watch sets into the frame. The cornea and the sclera are the structures that encase and protect the different and more delicate structures within. First we will explain some of the refractive errors (the reason we need glasses) then explain what some of the parts of the eye are and there function. Nearsightedness (myopia) is when the eye is too long or the curvature of the cornea is too steep and the focus of the rays of light that enter the eye fall short of the retina. The result, is a blurry view of distant objects. Astigmatism can exist alone or in combination with nearsightedness or farsightedness. With this condition the cornea becomes oval-shaped like a football instead of round, causing distortion when the eye tries to focus. Farsightedness (hyperopia) occurs when an eye is too short or the curvature of the cornea is flat. Light rays entering the eye focus behind the retina, and as a result a blurred image is produced, especially with near objects. Presbyopia is when the lens of the eye looses the ability to change focus. This occurs as part of the natural aging process and usually begins around 40 to 45 years of age. When we lose this ability to change focus it prevents us from seeing both near and distance simultaneously. A person will need to have extra magnification in his or her glasses in the bottom or bifocal part. A nearsighted person over 40 or 45 years of age will be able to see up close if they remove their glasses since their eyes naturally focus at near, but if they wear distance glasses they will then need a bifocal if they want to see near. Since this is part of the natural aging process, a person will develop the lens changes whether they have refractive surgery or not. 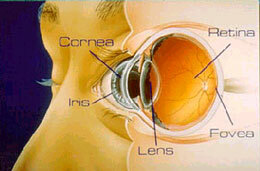 The cornea is the clear front surface of the eye. This clear tissue is like a window for the eye. It is composed of 5 different layers. The outer layer is called the Epithelium then comes the Bowman's Membrane, then the Stroma, then Descemet's membrane, the fifth layer is called the Endothelium and is on the inside of the eye. The cells and fibers in the cornea are arranged so that light can pass through it with a minimum of diffraction and internal reflection. The cornea contains no opaque substances such as blood vessels that would mar it's clarity. It receives its nourishment from the vessels surrounding the cornea. It is kept shiny and lubricated by tears that keep its surface moist. The lens of the eye is a transparent biconvex structure situated between the iris and the vitreous (a clear jelly- like fluid in the back of the eye). Most of the lens is hidden behind iris tissue, only the portion that is directly behind the pupil is visible. It is attached to the eye by means of fine suspensory ligaments called zonular fibers. A capsule, sort of like a transparent highly elastic envelope, surrounds the lens. The lens tissue inside the capsule is rather soft and puttylike in infants. With age it tends to grow harder, especially toward the center of the lens. The lens has the ability to change shape, which helps to bend the light as it passes through the eye. This helps to focus the light rays onto the retina. The retina is to the eye like film is to a camera. The retina contains all the sensory receptor for the transmission of light. It collects all the information and sends it to the brain. But the retina is also a part of the brain. The retina has two types of receptors, rods and cones. The rods function best in dim light; the cones function best under daylight conditions. There are many more rods than cones in the retina. Color vision is dependent on the integrity of the cones. The cones form a concentrated area in the retina known as the fovea, which lies in the center of the macula. Damage to this area can severely reduce the ability to see directly ahead. The macula is the area of the retina that we use for our fine and straight-ahead vision. If the macula or fovea are damaged, a blind spot appears in the central vision. Rods are in the periphery of the retina, not in the macula. If these are damaged, it can result in night blindness, but with good vision for straight - ahead objects.